Today I’m happy to announce another guest post; this time Sean Westfall is going to give us an extensive run down on Template Haskell. Template Haskell is a somewhat contentious extension, but still remains an important tool in the Haskellers toolbox, allowing us to solve problems concisely. Sean’s gone in to a great amount of detail in this post, and you’ll be sure to take something away with you. Template Haskell was introduced by Tim Sheard and Simon Peyton Jones in their paper “Template Meta-Programming for Haskell” (The original paper can be found here) in 2002, though its changed quite a bit since (see here). It was inspired by C++ templates, though TH is functionally more similar to a macro system. Quasiquotation is often used in conjunction with Template Haskell, but makes up a pretty big section, so I will only briefly describe it here. Only another full article of its own, could do quasiquotation justice. If you parse through the parentheses you’ll see the return expression forms a tree – an abstract syntax tree! -- the moment. Maybe that doesn't matter? tokens represented by it make up literals defined throughout your syntax in the AST, as you can see in our example AST above. Within Language.Haskell.TH.syntax, 35 generic data types are declared with the Data.Data module. If you’re curious about what the AST syntax is referring to study the source. The Q monad handles the expression’s typing via context, and also gives it a unique name by appending an integer at the end of the expression name to handle scoping distinction. Quotations are lexically scoped and the Q monad handles this using it’s naming scheme. (see the user’s guide wiki for a more in depth explanation of TH’s lexical scoping). Ta da, you converted concrete Haskell to AST and then evaluated it. Though, as you can see, identifiers have to be defined with the mkName type in the AST to evaluate properly. TH splices in the expression that fibQ represents along with the variable (that is fibs !! n). I’ll explain TH’s syntax next – but after, I’ll show some more impressive examples that show the possibilities of splicing and ASTs. Template Haskell quotation expression come with 4 different parser types, and an extensive 5th optional type that allows one to define their own types of quotations, called quasi-quotations. [| ... |], or [e| ... |], generates expression AST syntax; it has the type Q Exp. [d| ... |], generates a list of top-level declaration AST sytnax; it has the type Q [Dec]. [t| ... |], generates a type AST syntax; it has the type Q Type. [p| ... |], generates a pattern AST syntax; it has the type Q Pat. Quasi-quotations is a big second part to meta-programming. They’re essentially what makes it possible to write DSLs. I’m not going to cover it here since this guide is pretty long as it is, but if you’re interested, there are many guides to using quasi-quotations, find them here, here, and here (this one assumes you’re familiar with Parsec parsing). Though, if you’re just binding variables in GHCi with let, you don’t have to worry about this – only when you’re compiling Haskell. If you want to see the expansion of splices, use the flag -ddump-splices when starting GHCi : ghci -XTemplateHaskell -ddump-splices. -ddump-splices and >>= putStrLn.pprint should come in handy when debugging. Now for probably, what I consider to be the hardest aspect of Template Haskell to understand – reification. Reification allows one to query the state of Haskell Names and get information about them. Specifically, reify returns a data type called info – which returns data in a specific format on any Name in Haskell, where the format and information depends on whether it’s being interpreted in a type context or an expression context. 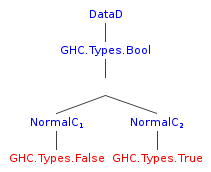 "TyConI (DataD  GHC.Types.Bool  [NormalC GHC.Types.False ,NormalC GHC.Types.True ] )"
The AST of a simple primitive type like Bool produces a small tree, but when used on types deeper down the module chain, relatively large ASTs will be generated. Try reify on ''Lit or ''Exp to know what I mean, though reify can work on any Haskell type. "VarI primeQ_1627395913 (AppT (AppT ArrowT (ConT GHC.Types.Int)) (AppT (AppT ArrowT (ConT GHC.Types.Int)) (AppT (ConT Language.Haskell.TH.Syntax.Q) (ConT Language.Haskell.TH.Syntax.Exp)))) Nothing (Fixity 9 InfixL)"
As you can see info returns different information depending on whether it’s a type or an expression. A type returns its structure in TH’s AST semantics. An expression returns information regarding its name, type, it’s constructor, and it’s fixity. Use reification of expressions to extract the types associated with the construction of an expression, then reify those types to get its structure in an AST. This allows one to generate the AST of any data type in Haskell – no matter how deep into Haskell it gets. Reification is very useful from the standpoint of what one can do with an AST to draw and splice back in code fragments within a programming language. Below, in Examples, the second example shows how one can use reify to extract the types from a record’s constructor to write a generic Show function that can generate a Show for any record. 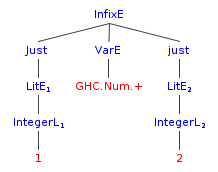 Notice that we had to separate the splicing and the expression definitions in separate modules, as mentioned in the syntax section above. --   show C         = "C"
This guide was for the most part written from collecting information written in other guides on Template Haskell, quasi-quoting, and Lisp macros – from online, wiki, and academic sources. Please check my bibliography to see where what came from what so credit can be properly given where it’s due. Meta-programming is a powerful programming technique that can allow for the generation of user generated syntax extensions and DSLs. This is useful in that it can allow a programmer to generate custom code generating syntax extensions without otherwise having to change the core language. Template Haskell in particular is especially powerful over similar programming language constructs (i.e. The C Preprocessor, Lisp’s Macro system) in that it makes use of ASTs, reification (through a specific function), and – much in the spirit of Haskell – type-safety. The examples presented above only scratch the surface of what’s possible with reification – imagine the ability to construction entire systems, and then use reify to build ASTs, then swap in and out entire modules, entirely with the use of Template Haskell. Some questions that have arisen within me from writing this article are: What are the limits of TH’s data type system? Is it truly possible for TH to represent all of Haskell with the finite set of data types written into the module? Is it possible for future language features to defy this set? What are the limits of meta-programming – TH, macros, and similar meta-prorgramming constructs make it possible to write code that writes code – but are there limits to this – is it possible to write a macro that can generate a macro, and so on indefinitely? Don’t forget to checkout the API. Everything you need to know, you can for the most part find in the source. Also TH does in fact have bugs, check the issue tracking page if you’re dealing with a known issue: see here.